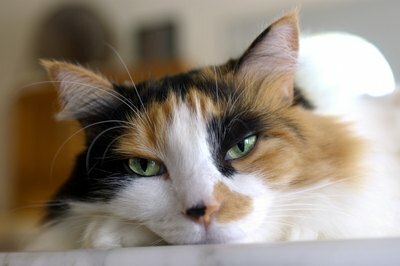 Cats with herpes may be droopy or lethargic. Cats do get herpes and can carry it for a lifetime, but feline herpes behaves differently than the human varieties do. If your kitty gets this virus he may seem mildly ill, but much of the time you may not even be able to tell he's infected. Feline herpesvirus is a common cause of upper respiratory problems in cats. This bug goes by a couple of other names, including rhinotracheitis and feline viral rhinopneumonitis (FVR). It is a very common virus, and many cats end up being exposed to herpes during their lifetime. If your kitty acts like he has a cold, it may very well be feline herpesvirus that’s behind it. Once a cat gets this virus, it’s likely to stay with him for the rest of his life, though it may not cause any problems unless your cat is stressed. Herpesvirus in cats is an upper respiratory infection that can cause a range of cold-like symptoms. Among the most obvious signs of feline herpes is lots of sneezing, accompanied by discharge from the eyes and nose. Your kitty may also develop eye problems, such as pink eye, ulcers and eye lesions, and his discomfort may cause him to squint. He’ll also show more generalized signs of illness, including lack of appetite, a fever, and overall depression or lethargy. Congestion is also a frequent problem, and if it becomes severe it can turn into pneumonia. Cats who are living in stressed or crowded conditions, such as shelters and boarding kennels, are at the highest risk for contracting herpesvirus. Vets often treat the disease with antibiotics, eye drops and ointments to prevent secondary bacterial infections. Your cat can have herpes and seem fine, but if he gets overly stressed he may begin to show signs of the disease and require veterinary treatment. Giving your cat a peaceful, comfortable life can help to keep herpes symptoms at bay and keep your pal in good health. Cats can transmit herpesvirus to other cats, but they can’t pass it to members of a different species. This means that even though your cat can give herpes to the cat next door, he can’t pass the virus to you or your dog. Your kitty can get it if he comes in contact with discharge from an infected cat, whether by being sneezed on or eating from a contaminated dish. Vaccination with the FVR -- feline viral rhinopneumonitis -- vaccine will help to prevent or minimize your cat’s risk of becoming ill from this highly contagious virus. How Does Herpes Viral Conjunctivitis Spread Among Cats? Why Will a Cat Not Use a Litter Box? Can You Take Cats on a Cruise? Do Cats Like Getting Scruffed?